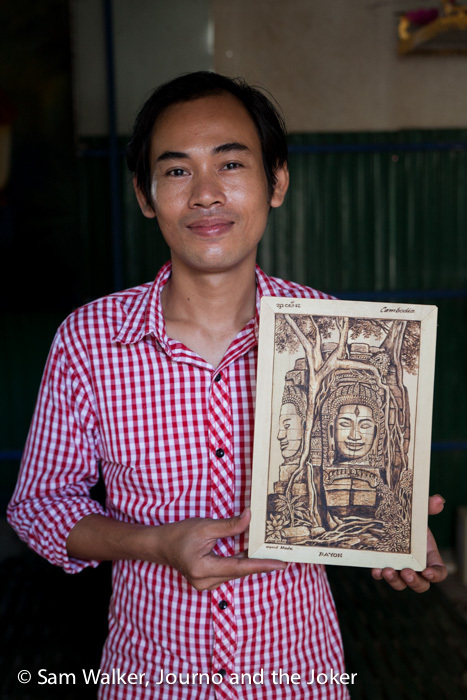 Roeum Bunhak’s skill at burning pictures onto palm leaf is earning him a name in Cambodia’s art world. The Cambodian artist is at the forefront of his genre with many accolades to his name. His studio is a large, sparsely furnished tin shed. The light is dim and he works at an old desk. Beside him, to his right is a brazier with hot coals and a collection of “iron pencils” of different sizes. 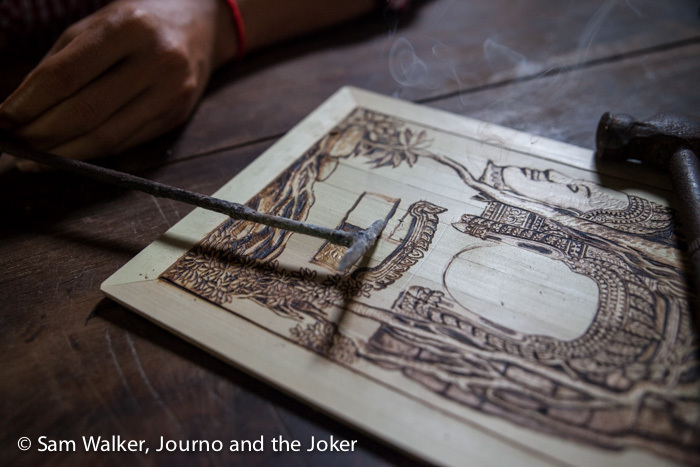 He pulls a smoking hot iron pencil from the coals and applies it to the palm leaf “canvas” in front of him. Each delicate, well-placed stroke slowly bringing the faces of Angkor Thom to life. Not surprisingly, most of his works depict a scene from one or other of the Angkor temples that Siem Reap is famed for. But he says he can do anything and will copy pictures of people or places for those looking for something more personalised. Bunhak’s English was limited and we spoke through a friend who interpreted for him. But each picture takes him a few hours, varying with the size and he sells them mostly through outlets in the city’s tourist centre. He was quietly spoken and obviously proud of his achievements. Many of Cambodia’s artists and the skills they had developed were lost in the turbulent years of the Khmer Rouge and the aftermath. Art is not widely taught at schools and creative development is not widely encouraged in schools or outside. But slowly the art scene is re-emerging and skills are being taught to a new generation. I had the pleasure of meeting and photographing this talented Cambodian artist last week for an assignment for the Phnom Penh Post. 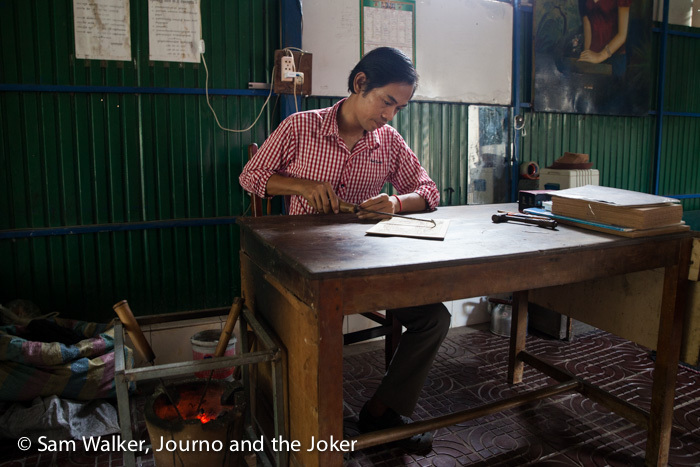 You can read his story by journalist Vandy Muong here. I love the variety of people I get to meet through this wonderful adventure we are on and through my work as a journalist and photographer. Have you met anyone inspiring lately? Thanks Julia. Yes, he is very talented. We are hoping to order some personal art work from him.